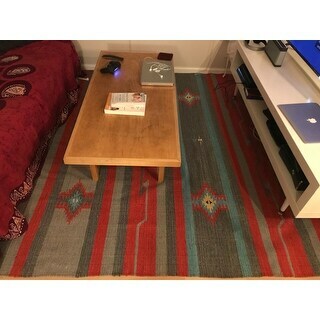 Awesome rug and a great price! Very vibrant colors. It fits perfectly in our space! It definitely looks as great in person as it does online. 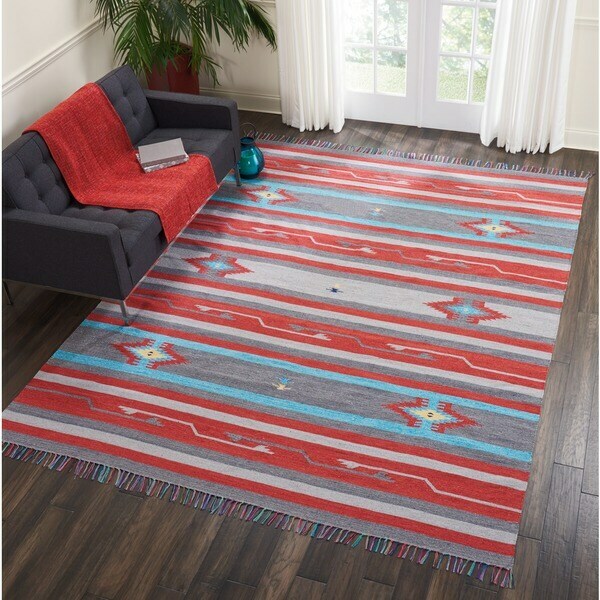 Get years of use from this reversible rug designed for moderate-traffic areas of your home. Handmade from acrylic, cotton, and polyester for lasting strength, this colorful Moroccan-inspired area rug contains no latex, making it ideal for families with latex sensitivities. This is a great rug for the price. Nice colors. Love the colors. Rich and red and calming gray and blue. Just beautiful! Was going to use it for one of my guestrooms but loved it so much I am using in my bedroom! Beautiful rug, in person it looks exactly like the online photos. Great quality for the price. This was such a great price that I bought it for my husband' garage mancave. However, it is so beautiful that I moved it inside. Great quality. We love it! Colors are just like pictured. Red,Turquise and dark gray.